Note: Today we publish the first of six finalists' essays from our 2012 writing competition, "How did you learn to cook?" Catherine Seiberling Pond, prodigious writer, author of The Pantry—Its History and Modern Uses, and multi-blogger, included precious family pictures to illustrate her essay, and generously allowed Savoring Kentucky to publish them. Catherine has lived on a farm on the Pulaski-Casey County border for a few years now. She was born in Akron, Ohio. Thank you, Catherine, for sharing this work and the photos with Savoring Kentucky fans. Enjoy, everyone! 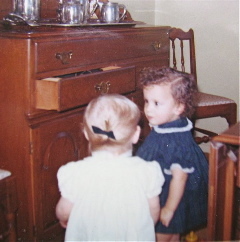 It was from my mother’s pink 1950s kitchen in our suburban Akron, Ohio home that I began my peripatetic adventures in cooking. I worked hard alongside her with my pink cardboard kitchen appliances I got one Christmas and, a few years later, the much-coveted aqua Easy-Bake Oven™. Oh the meals I made with my celluloid play food and those cute little boxed mixes that required only water and a quick slide under a light bulb! One summer I made cakes for Mr. Sargent, a curmudgeonly widower who lived down the road from my grandparents’ farm in New Hampshire. Every week I would bake him a cake—still boxed at that point—and he returned the kindness with a box of cookies or a watermelon, and a shy ‘thank you.’ That same summer my grandfather drove me to the village with regular gusto to get a roll of Pillsbury® chocolate chip cookie dough to bake him some cookies while he watched Perry Mason and napped upon the long and tattered Chesterfield couch in the living room. He wasn’t supposed to have such things but that didn’t keep him from his addiction to chocolate. For several years after he died we would find his “books” in drawers around the house: “I’m going to read a page from my ‘book,’” he winked. I was nine years old when I attempted my first cake from scratch. It was a single yellow layer cake, quite thick, and after my first nibble I started to laugh. I had wanted to impress the large assembled clan with my latest skill (and it was the same summer I learned to make a perfect roux). There was an audible burst of relief when everyone realized that even the cook agreed that the leaden, lumpy cake was a bust, along with its perfectly awful meringue icing. For many years, until I had all but given up the notion of food preparation as play time, I subjected my family to my “restaurant” whims when I wrote menus and actually cooked everything on them (mostly casseroles). Another time I surprised my mother with a multi-course meal (mostly casseroles) for one of her birthdays. After school I often made a batch of brownies for my brothers and myself. [The “Brownies Cockaigne” in the 1970s edition of The Joy of Cooking is still my go-to brownie recipe.] From high school, food has been my drug of choice. When I was sixteen, on an exchange program to England, the Mayor of Lincoln and his entourage were treated to an entire American-style meal to my catering specifications (I had brought the Yankee New England Cookbook, after all, as a gift to my host family). Imagine his surprise, and my flush of embarrassment, when I indelicately spilled a bowl of hot corn chowder in his lap! This would end my catering career before it ever began. I’ve always been a home cook and baker. After my boxed mix evolution, I acquired no formal training apart from a love of good food and dabbling in all manner of cookbooks. I even slavishly copied most of the recipes from The Buttr’y Shelf Cookbook when I was ten (until I was able to buy it with my own money). My meals today are prepared from an intrinsic sense of comforting New England fare—with a bit of Midwestern German and English stodge thrown in for good measure. Since living on our own farm, I’ve learned to preserve and can all manner of things. Aside from my reliable pot roast or mac and cheese, there is often something more exotic on the menu or from the abundance of local produce or wild offerings here in south-central Kentucky—and I still make some mean brownies Cockaigne.